Flicker is the name given to changing light intensity caused by fluctuations in the voltage. It is the second most common power quality problem causing both irritation and possible medical consequences to users exposed to its effects. In the PM Series, Flicker is presented in four ways; Instantaneous Flicker Sensation (Pfs), Short Term Perceptibility (Pst), Long Term Perceptibility (Plt) and Flicker Flag (Flg). Instantaneous Flicker Sensation (Pfs) is a very short term assessment of how the (i.e. a model of the) eye and brain respond to flickering incandescent lights. Below is an example of particularly bad Flicker. Short Term Flicker Perceptibility (Pst) is the measure over a short period (a few minutes) of how irritating flicker is thought to be. Irritation may be caused by consistent minor flicker or occasional major flicker events. The statistical treatment used to obtain Pst is intended to model the way humans react. Long Term Flicker Perceptibility (Plt) is a further measure for cumulative irritation caused by very occasional gross flicker events, which may be too infrequent to cause meaningful Pst results. In the graph below, the measurement plotted every 10 minutes is the average flicker value of the last 2 hrs. The Flicker Flag (Flg) function is used to signal to the user that input conditions which should not be part of the flicker assessment are present, and have been excluded from the short and long term calculations. The Conditions which are Flagged (and excluded) are variations in excess of 20% from the mean. Dips, surges, brown-outs and the like could otherwise have an overwhelming effect on the flicker results, and potentially make the normal low level flicker assessment impossible. An Instantaneous Flicker Sensation (Pfs) measurement of 1 is the point at which 50% of the human population becomes aware of flicker. A short term flicker Perceptibility (Pst) measurement of 1 describes the point at which 50% of the population actually becomes irritated by the flicker while long term (Plt) indicates the irritations caused by irregular flicker effects over a long period. Instantaneous Flicker Sensation is the constant flicker measurement required by the standard IEC61000-4-15 to generate statistical values for short term flicker (Pst), over 10 minutes, and long term flicker (Plt), over 2 hrs. Instantaneous Flicker Sensation is very difficult to measure due to the fact it gives very dynamic results. It is described inside the logger as numbers with vastly more precision that it is displayed simply due to the complexity of its nature. Due to our Single Cycle Adaptive Store recording regime and our software we can display and print Pfs for the entire length of a recording. A Power Master Series Exclusive. In PM Series products all three parameters, Pfs, Pst and Plt, are derived using the IEEE 1453 and IEC 61000-4-15 model for human behavior. The measurement process meets all the Flicker tests specified in both Standards, and in addition meets the linearity tests being proposed by CIGRE for the highest class of instruments. For more information on Flicker and the results of these tests, please see our Knowledge Base article 'Flicker in the PM Series'. The most obvious application is to investigate complaints, either residential or otherwise, of flickering lights. Pst and Plt are both traditionally used, being all that is available in standard analyzers, however, Pfs is a valuable parameter showing quantitatively whether an installation may or may not suffer flicker problems. It is particularly valuable when related in time to load variations at an installation. With a more detailed Pfs measurement, closer correlations can be seen between the Flicker and the RMS voltage which produced it, thus enabling the user to pinpoint the cause more easily. Where you have possible sources of flicker, e.g. motor start up, furnace start up or the introduction of a piece of equipment, intermittent in its use of current, then managing its effect on the voltage network is critical to its acceptability. The straight forward excursion observed on voltage is not always a good indicator of the flicker caused by this event. Its shape is critical, for instance sinusoidal or trapezoidal are less severe than rectangular. The bottom line of the effect is measured by the Pfs so this is an ideal parameter with which to assess the flicker consequences of imposing voltage fluctuation on a network. Remember with Adaptive Store you can zoom into this graph down to single cycle detail. So things like generator start up, motor start up, turbine switch in/connection, anything for which a soft start might be considered, are good candidates for examination with Instantaneous Flicker Sensation. The virtually unlimited memory capacity of the PM7000, with the use of a memory stick, and thePM3000HF with it's new memory extension options mean that you can get even more detailed recordings of the Instantaneous flicker measurement thus giving more visibility to the user. 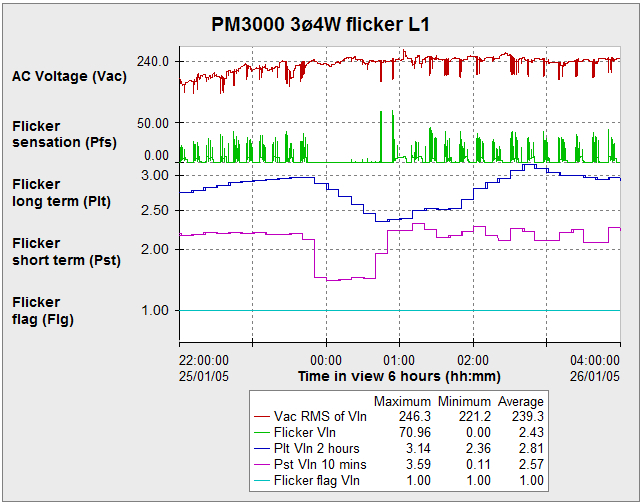 For more information on Flicker parameters and how they are measured in the PM Series of analyzers, please see our KNOWLEDGE BASE article 'Flicker in the PM Series'. Finally, for more information on other aspects of our software please search for them in our Knowledge Base .